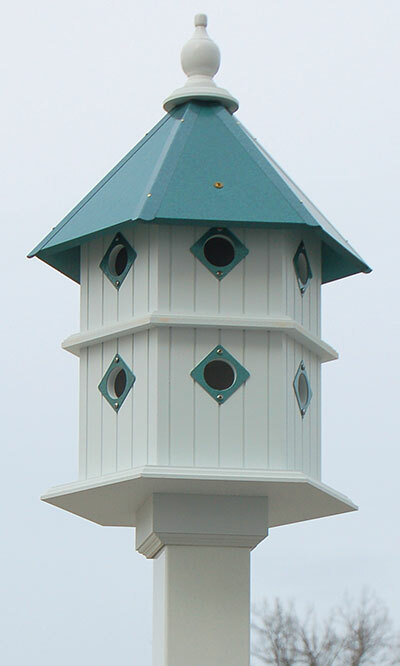 Create a spectacular bird sanctuary in your yard with the Wing and A Prayer Chateau House. This grand home offers housing for six bird families at once, and brings elegance and drama to any surrounding. The hexagonal shape lends interest to the piece, while the verdigris colored hexagonal roof has a steep pitch for added height. A white finial at the top of the roof completes the look. Each side of the dual-level home has a 1.5" diameter entrance hole, surrounded by a metal predator guard which matches the roof. Recessed lines on the white walls add a paneled feel for extra charm. Each of the six compartments has two separate entrance holes, and the offset entrances help prevent territory disputes. The interior floor and walls are made from unfinished wood, helping to keep nestlings safe. For simple cleaning and nest checks, remove the finial and roof, and lift the interior walls. A preinstalled mounting collar has an extra brace on each side for added stability, and easily offers a way to mount the home to a 4" x 4" post (not included). The PVC trimboard construction creates a sturdy home that will not mold, rot, mildew, or delaminate, and remains stable for 25 years for faithful service. Add an impressive look to your bird garden with this Chateau House. Made in the USA.